Semtech Corporation (Nasdaq: SMTC), a leading supplier of analog and mixed-signal semiconductors, today announced the RClamp2431TQ, a single-line Transient Voltage Suppression (TVS) device engineered to protect automotive antennas from electrostatic discharge (ESD). 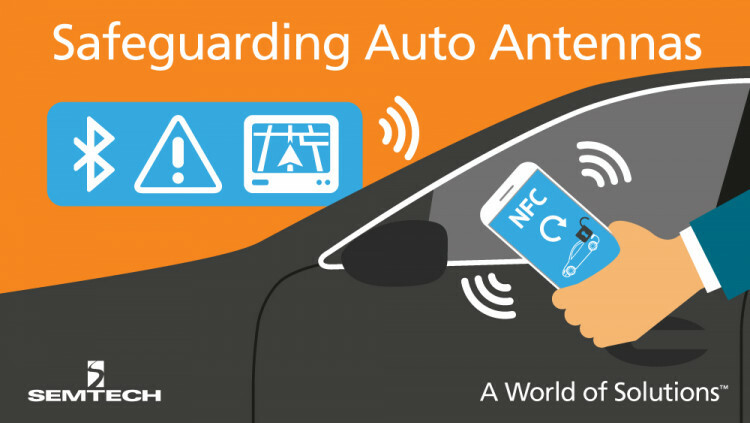 With the rapid proliferation of wireless communications in automobiles, the number of antennas needing robust ESD protection has increased. The RClamp2431TQ, part of Semtech’s AEC-Q100 protection platform, offers a unique combination of low-clamping ESD protection with an ultra-low capacitance rating, making it ideal for safeguarding car antennas against the harsh electrical transient threats present in vehicles. The ultra-low capacitance of the RClamp2431TQ enables it to operate on high bandwidth antennas without compromising the signal integrity of the radio frequency (RF) link. With a 24V working voltage, this device is well-suited for safeguarding emerging applications like near field communication antennas. In addition to low-capacitance, RF links require a high working voltage TVS with sufficient low ESD clamping voltage performance. When compared to existing standard polymer devices, the RClamp2431TQ achieves as much as 40 percent reduction in ESD peak clamping voltage. The RClamp2431TQ (order code: RClamp2431TQTCT) is available immediately in production quantities and is priced at $0.33 each in 10,000-piece lots. Semtech offers comprehensive design assistance, including field- and factory-based support. Data sheets, volume pricing, and delivery quotes, as well as evaluation kits and samples, are available by contacting info@semtech.com. All statements contained herein that are not statements of historical fact, including statements that use the words “offers,” “enables,” “provides,” or other similar words or expressions, that describe Semtech Corporation’s or its management’s future plans, objectives or goals are “forward-looking statements” and are made pursuant to the Safe-Harbor provisions of the Private Securities Litigation Reform Act of 1995, as amended. Such forward-looking statements involve known and unknown risks, uncertainties and other factors that could cause the actual results of Semtech Corporation to be materially different from the historical results and/or from any future results or outcomes expressed or implied by such forward-looking statements. Such factors are further addressed in Semtech Corporation’s annual and quarterly reports, and in other documents or reports, filed with the Securities and Exchange Commission (www.sec.gov) including, without limitation, information under the captions “Management's Discussion and Analysis of Financial Condition and Results of Operations” and “Risk Factors”. Semtech Corporation assumes no obligation to update any forward-looking statements in order to reflect events or circumstances that may arise after the date of this release, except as required by law.